Making Thor a woman was a bold move by Marvel Comics, and it’s paid off considerably for the publisher. The current female-led Thor title is consistently outselling the previous volume of writer Jason Aaron’s run by around 20,000 copies a month, a significant boost in sales that proves change can be a very good thing. It helps that the book is a whole lot of fun, pairing Aaron with artist Russell Dauterman and colorist Matthew Wilson for a beautifully rendered action adventure that fully explores the wide scope of Thor’s world. It builds on the events of Aaron’s Thor: God Of Thunder while still having its own distinct flavor, making it one of the most captivating titles of Marvel’s recent “Avengers Now!” initiative. The art team gives the new Thor a powerful presence, which is highlighted in this preview of next week’s Thor #7. This issue pits the title character against The Destroyer, the living weapon that has caused plenty of trouble for Thor in the past. Dauterman and Wilson bring loads of energy to the fight sequences on this title, establishing that the new Thor is just as much a badass as the previous incarnation, and these pages have a forceful intensity that is a great start for what is sure to be a brutal beatdown. 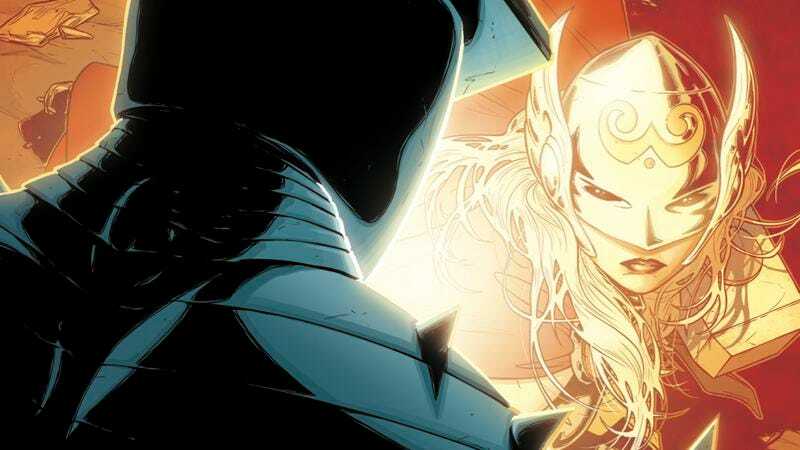 Even though readers still have yet to learn the true identity of this new Goddess of Thunder, she’s built up a strong fan base through her actions, proving that a woman is more than worthy to wield Thor’s hammer.